Another week of homeschooling fun is complete and we are truly enjoying school this sixth grade year. It was an odd week for us, where it seemed like very little would be accomplished, but in the end as I look back we completed almost everything on our list plus some additional housekeeping tasks. Amber has still been overly tired and groggy in the mornings (hmm.. wondering if it is the medication now) resulting in some major adjustments to our schedule at the last minute each day. Of course there was the requisite doctor's appointment to throw off the schedule on Tuesday which we barely made on time due to Amber's drowsiness. Right away on Monday after our late start, we decided our best daily plan would be to take the subjects one at a time and see where we got without attempting to complete everything each day. Do you know we finished all the scheduled items anyway? I think it was the relaxed attitude and frequent kitty petting breaks that made all the difference. We made all the activities this week! 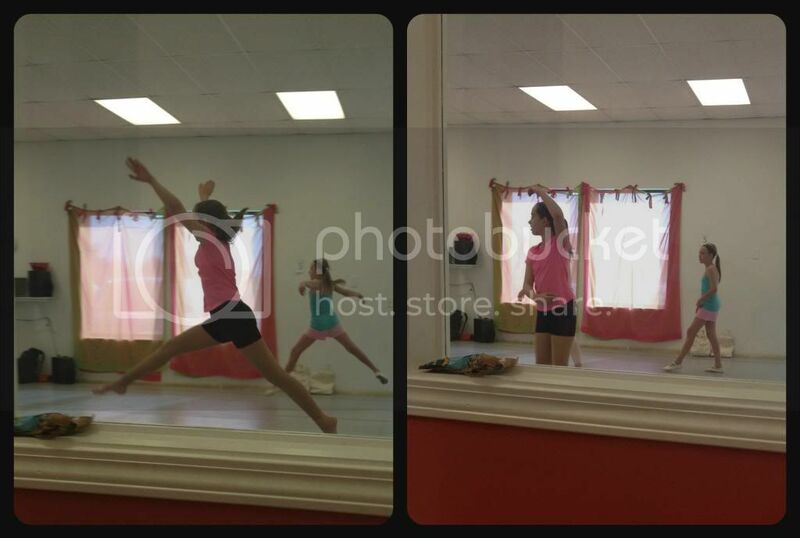 These are a couple of snapshots from Amber's lyrical class. The dance for this semester starts with a leap, and goes on from there. I'm not a great photographer, so Amber is already on her way down in this picture. I can never get her full leap height. Tuesday, besides the stressful appointment with a shot, Amber also stayed up quite late. Fred had to attend for work, in his words, "the slowest baseball game ever". Obviously, if you've watched the sports news lately, there has not been a recent record set for the slowest baseball game, but Fred was none too pleased with attending. He was in an air-conditioned suite with dinner served, but Fred is not a baseball fan and was tired from a full day at work. Amber initially refused to go to bed before Daddy came home from the slow baseball game, however she eventually gave it up. Still it was too late to prevent Wednesday from being a mess because she truly has no strength reserves yet. When I had to drag Amber out of bed at 10 am Wednesday morning, I decided it would be a good day for some extra Bible study, art appreciation, literature reading, and house cleaning. 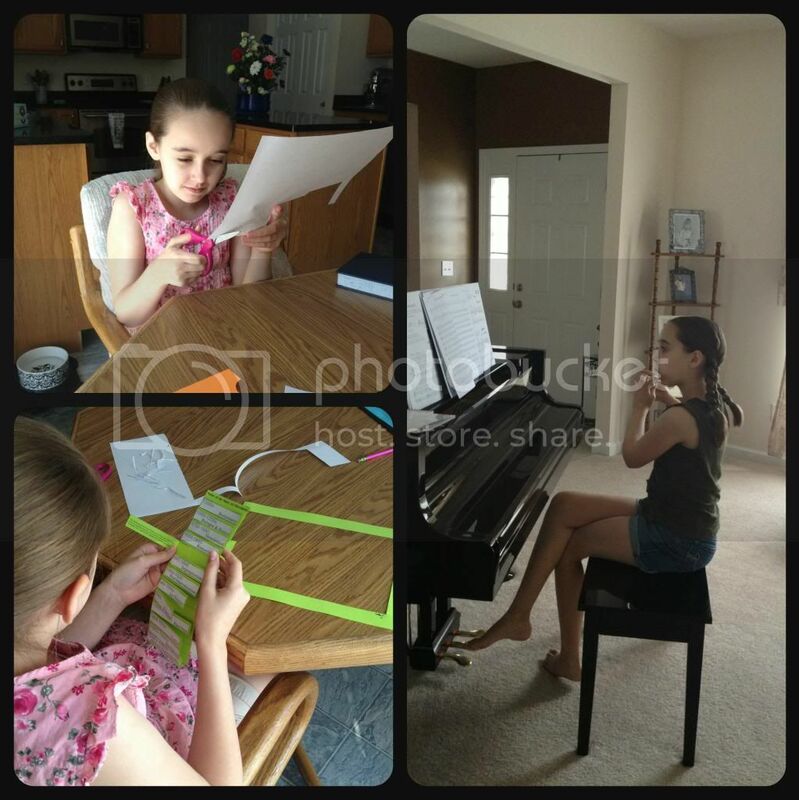 Amber also had flute lessons in the afternoon, lessening the amount of school time available. This turned out to be one of the best decisions of the week. Amber was focused in everything she did accomplish and managed to regain her stamina for our Thursday field trip. (TOP) Working on a Tower of Babel project. (BOTTOM) Working on Art Appreciation project - art movements. We love Homeschool in the Woods products. (RIGHT) Practicing flute! She has been very diligent and is doing excellent according to her instructor. 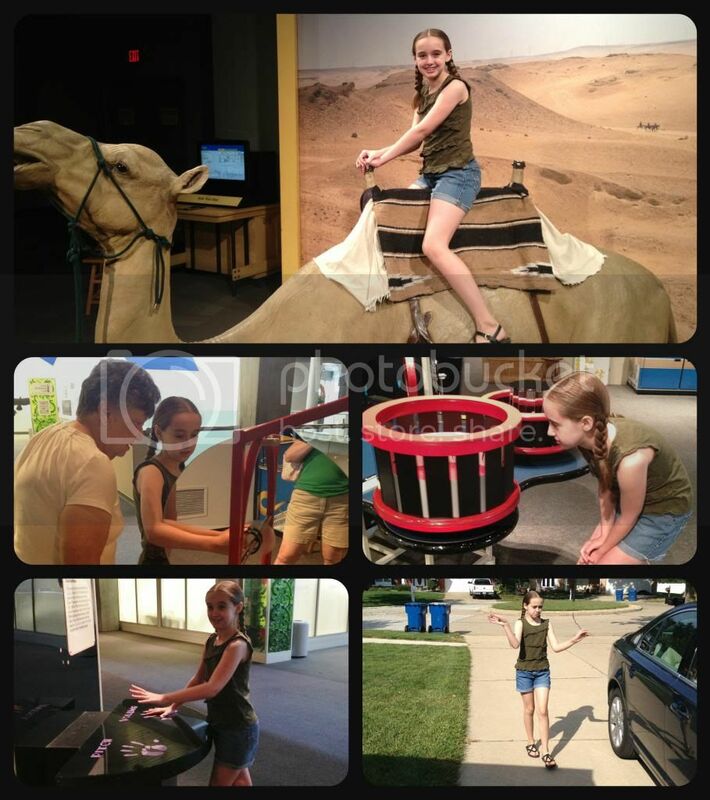 Thursday we took our first field trip of the school year to the St. Louis Science Center to see the Lost Egypt exhibit. This was a fantastic choice and perfect timing as we found out it only runs through Labor Day. Amber is studying ancient times and just had her first introduction to Egypt, so I thought it quite fortuitous that we could manage this trip. My mom went with us on Thursday, as she does on many field trips. She always thanks us for including her, but we are the lucky ones. It is so wonderful to be able to have her along for her extra tidbits of information, to have her encourage Amber when I get lost in the details, and to simply share our days with her. Unfortunately, photography was not allowed in the Lost Egypt exhibit, except at the designated fake camel. Of course, I couldn't even manage to stand in the right spot and so am off center from the painted backdrop for the photos. The exhibit emphasized the archeological methods that could be used to learn about ancient civilizations, and included hands on examples for visitors. They also had an actual mummy with her coffin (but the mummy was out of the coffin), random small artifacts, a replica Rosetta stone, and replica tomb paintings in mini-tombs. All in all, it was a very well done exhibit and worth our time. (TOP) Amber at the one photo opp location inside the Lost Egypt exhibit. (MIDDLE-L) Amber and Mom in the Science Center's optical illusion section. (BOTTOM-R) At Grandma's house, "Don't take my picture yet"
This week we also signed Amber up for more art classes at the Painted Pot, the local paint your own pottery and art shop where Amber took lessons last year. I know, I know, our schedule is full. Amber so loves to take classes there and they were on a day when we could actually manage it. Besides, she doesn't get much by way of art lessons at home. We do lots of needle crafts and some other random crafts, but I am not in any way ever going to be able to provide artistic instruction. The art classes are in 6 week sessions that still won't start for a few more weeks. So, we have a while to get used to the idea still. I also managed, thanks to Plan to Eat, to cook a large portion of our meals this week. Fred was not home for dinner two nights and still I cooked for us. I even cooked on the weekend, which is an unheard of event. It's been horribly hot this week, so a lot of the meals have been stove top or crock pot, but it worked out. There was one meal that Amber and I both reacted badly to and I'm not sure which item caused the digestion problems. Everything was gluten-free and from scratch, except some place-and-bake gluten-free cookies I made for dessert. Yet, we ate those cookies for 3 days and only had trouble on the first day. I'm looking into a dairy / lactose problem for us both now, because unfortunately the baked potato soup from the day in question included whipping cream that was not cooked with the soup. Normally all of our dairy milk products have been cooked first. 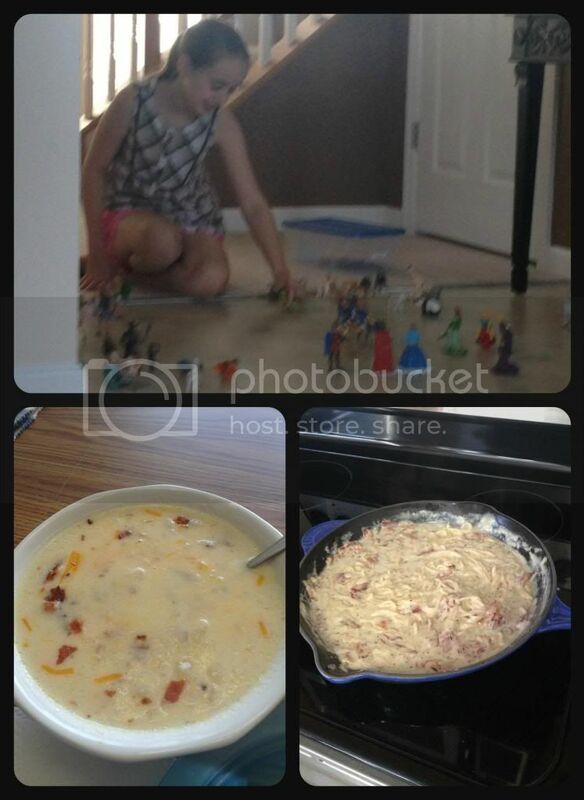 (BOTTOM-L) The made from scratch baked potato soup that may have caused a GI reaction in us. Sigh. It was yummy. (BOTTOM-R) Gluten-Free Pasta Carbonara - Oh how I've missed this dish. It was super yummy, and Fred even agreed he couldn't tell the difference. I think we have finally found the right noodles. Yay for Plan to Eat! Is that the same Baked Potato Soup that I make? We love it, but I'm so sorry it didn't agree with you all.... but I am glad that Plan to Eat is allowing you to cook more. It does that for me - I am just more organized and planning is so much smoother. We also LOVE Homeschool in the Woods projects!! They are just so beautiful, aren't they? LOL! I'm from the St. Louis area, so I was raised on Cardinal baseball. We listened to or watched every game every summer. Even though I'm not a sports fanatic, I still enjoy a good baseball game. Poor Fred is not from around these parts. ;-) He just doesn't get baseball towns. We still love him even if he'd rather watch football. I always love reading about your weeks since you have an only child like I do. Love the dance pictures and the Egypt exhibit!! Kei and I would love that. Amber seems to love creative outlets just like Kei does. It has been horribly hot here too! Here is to a cooler week. Way to go on cooking. I always find it hard to cook when my husband is not home.